I spoke at Alt on a panel about parties with Ashley Meaders, Victoria Hudgins and Brittany Egbert. I gave a talk about six tips to take your party to the next level. These are basically 6 things you could do to give your party a little more pizzaz. Just choose one or two of these to implement if you are out of ideas or feeling uninspired. 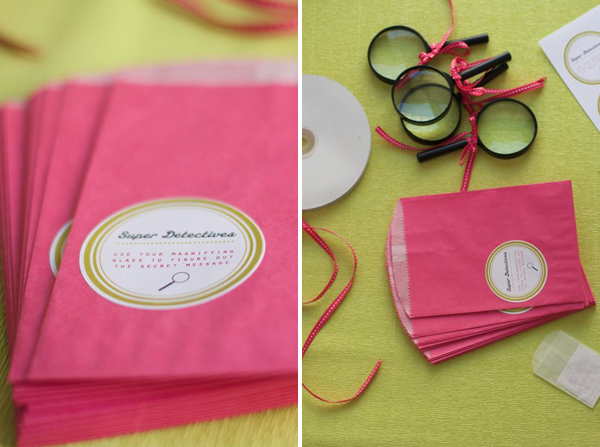 Sending out special invitations sets the tone for the party. Evites are easy and practical but if you are going to the effort of putting a party together try to send out real invitations. If you do something unexpected then you will get a higher percentage of attendance–people will want to stop by and see what you are going to do. Below is a detective party invitation I made with tiny print and a magnifying glass to go along with it. Committing to a theme makes it easy to make decisions about the rest of the party. It doesn’t have to be a generic theme, you can pick any random thing and just run with it. My friends threw a party where the theme was A Very Hairy Birthday Party. 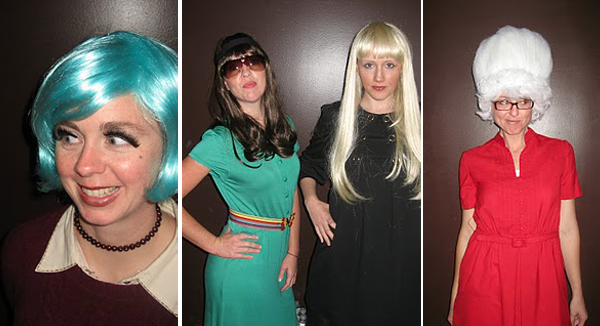 Attendees came wearing various wigs and facial hair. It was silly and fun and unexpected. I try to have an element of surprise in every party I do. I think it makes it more fun. In this treasure hunt party we did we didn’t tell anyone what was happening so it was a surprise from start to finish. 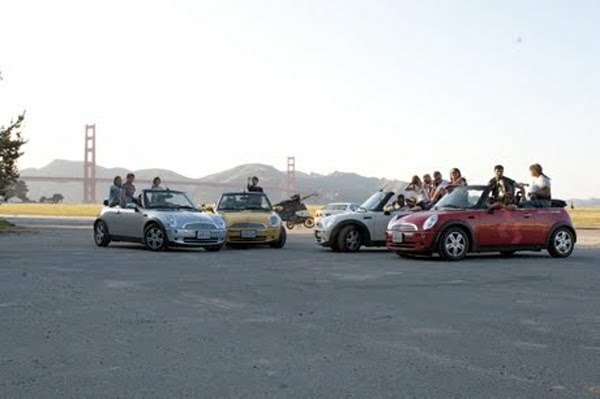 We rented mini coopers and went all over San Francisco. 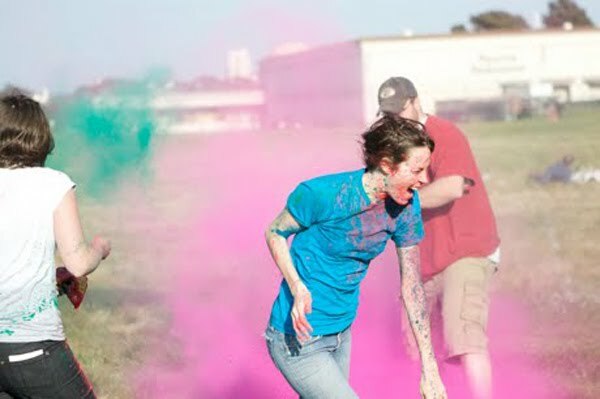 At the end we had a surprise color fight in front of the Golden Gate Bridge. Give your guests creative assignments. This is something my friend Rebecca taught me to do. Give your guests some perimeters and it will surprise you with how creative they get. 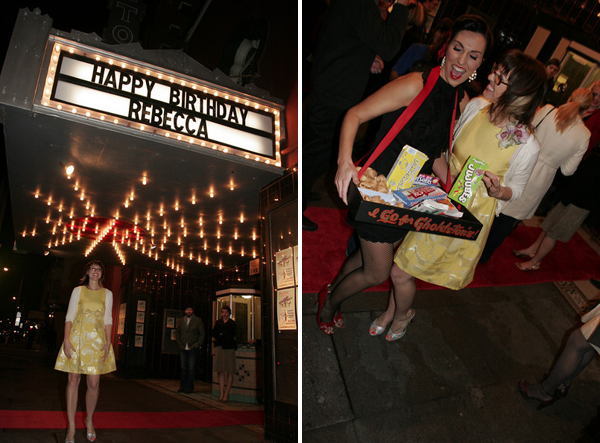 For her 30th birthday she rented a theater on a Tuesday night (when it was dirt cheap) and held a film festival. She invited everyone she knew to create a 3 minute short film and then we all watched them at her party. Complete with cigarette girls and red carpet. This is an easy way to make things look good. Commit to one color and make everything that color or variations of that color. This picture is from a church Christmas party I planned. We made a cheap party look swanky by sticking to one color. If you get 5 balloons to decorate your party, it will look normal. But if you get a small room and fill it with 500 balloons it is going to make a huge dramatic impact. Take something cheap but do it on a large scale it will be more impressive visually. 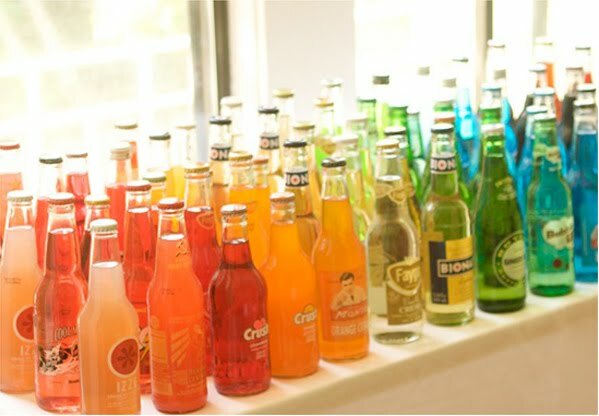 Here in this soda bar I made, its much prettier with all the bottles than if I had a few up on display. Wow, thank you thank you! These steps will help immensely with some upcoming events! Jordan! I so enjoyed your panel – you are seriusly my hero I am SO glad I got to hear you speak I took a lot away from that talk – now I want to go and find any excuse to throw a fabulous party!! Thanks for sharing all your tips!! 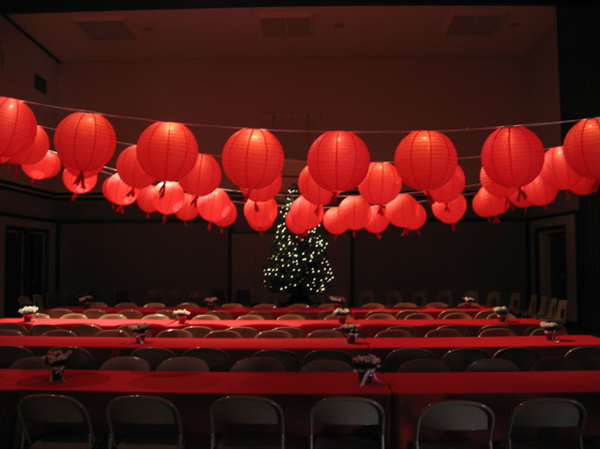 great tips and I wish my church christmas parties looked so simple yet fabulous as did your image. usually they are just tacky. I don't throw fabulous parties like you do but I do remember you telling me the invites were important … so when we do a party the invites are good. I hope you have some cool friends in France you can throw crazy parties for! beautiful! i love all of these ideas…especially the very hairy b-day party…that could be loads of fun! LOVE these tips! Your parties always look so fun and unexpected! Jordan! I loved your speech and think you're incredibly talented! Thank you for sharing your tips! Thank you SO MUCH for posting this!! Not only are these fantastic suggestions, but I'm so touched that you shared what you spoke about at Alt. This makes me, and probably all your readers, feel extra special! Thanks!! P.S. I'm sharing this with my mom! Ooh, I am tingling with excitement after reading this party guide. (Okay, that seems to weird to type, but your tips made me giddy!) I am planning a donut party – I'm obsessed – and think these tips will be very helpful. Thank you! Perfect! My daughter's ninth birthday is this Saturday and I still have time to incorporate some of your fab ideas. I'm so with you on the invitation tip. It makes such a huge difference and I think it makes the party that much more fun to put together from the get go (I may be a bit biased). I'll be putting your other tips into practice, too. You always throw the best parties. Thanks for sharing all these awesome tips! I love reading about all your great parties on your blog. I love all of these party ideas, but I'm more than a little partial to anything involving a Mini Cooper! The wig party sounds like a blast. What did you use to have the color fight? that looks like tons of fun! that monochromatic church party is really inspiring. it's always tough to prettify a church gymnasium, but that's genius. Great inspiration! I'm planning my hubby's 30th and was thinking of doing "real" invitations. I'm definitely going to now! So much more special. Wow. That scavenger hunt party? Yeah, I want to be your friend. Amazing ideas, thank you. I'm in awe of your party skills. Thank you for such fantastic inspiration! Just found your blog via Lilly's Notebook and My Little Green Notebook. Becoming a follower right away!